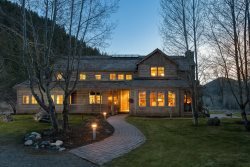 Elkhorn Pool, Tennis and Ski Lift- All within a 2 minute Walk from the Home! With Dollar Mountain and the Elkhorn Ski Lift in your "backyard" and the Elkhorn Village Pool, Spa and Tennis Courts one block away- this 3,200 SF 4 BR / 4.5 Bath Townhome with Air Conditioning is perfect for your next Sun Valley Ski or Sun Valley Summer Vacation. GOURMET KITCHEN: The chef of the group will truly love the fully equipped gourmet kitchen with Stainless Steel Appliances, 6-Burner Gas Cooktop, and Island with Counter Seating for 3. DINING AREA: Enjoy meals with friends and family at the adjoining dining area (seats 8) while gazing at enviable mountain views. PATIO: In the Summer and Fall, open the double doors and listen to the tranquil sounds from the waterfall feature or dine alfresco on furnished private patio with Gas Grill. LIVING AREA: After a long day on the mountain or river, relax in the spacious and comfy living area with Cathedral Ceilings, Natural Light, a Gas Fireplace, Flat Screen TV, and DVD Player.